Darrel Janzen was a student at UFV from 2003 to 2006, where he completed his Associate of Arts degree. 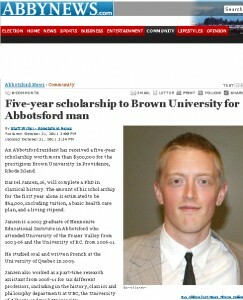 An Abbotsford resident has received a five-year scholarship worth more than $300,000 for the prestigious Brown University in Providence, Rhode Island. Darrel Janzen, 26, will complete a PhD in classical history. The amount of his scholarship for the first year alone is estimated to be $64,000, including tuition, a basic health care plan, and a living stipend. 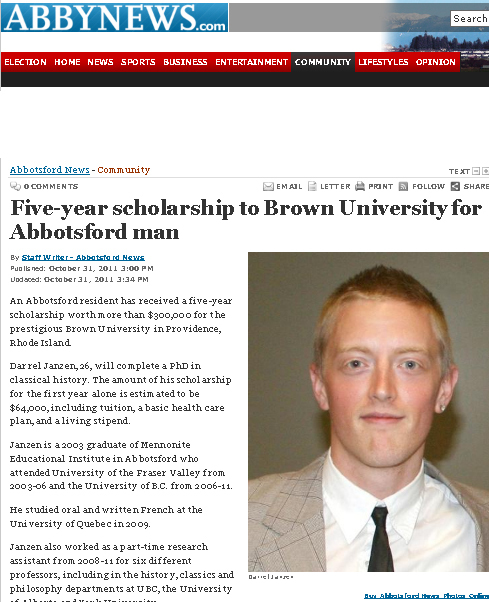 Janzen is a 2003 graduate of Mennonite Educational Institute in Abbotsford who attended University of the Fraser Valley from 2003-06 and the University of B.C. from 2006-11. He studied oral and written French at the University of Quebec in 2009. Janzen also worked as a part-time research assistant from 2008-11 for six different professors, including in the history, classics and philosophy departments at UBC, the University of Alberta and York University. This role enabled him to contribute original research and editing skills to help get several articles and a book published. He then applied for, candidated and won the Brown University scholarship to further his studies in classical Greek and Latin literature, history, culture and related fields. Janzen’s future plans are to teach classical history, Greek and Latin.